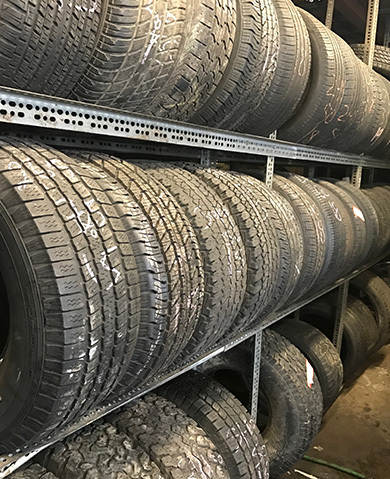 Most automobile tires have a built-in tread wear indicator in the tread area of the tire. This wear indicator will show when there are 2/32" remaining on the tread. Depending on your driving habits or conditions you should replace the tire no later than when the wear indicator is visible. Consult a tire professional when tires show signs of wear. How can you tell what size replacement tire is best? To maintain your car's original ride and handling, make sure the aspect ratio of your new tires matches the ratio listed on your car's original tires or on the placard on the door edge, fuel filler door, glove box or visor. The aspect ratio is the ratio of the height to the width of the tire. If looking at the tire, find the two numbers listed before the letter "R." They designate the aspect ratio. For instance, a tire with the size designation P215/65R15 has an aspect ratio of 65--meaning the tire is 65 percent higher than it is wide. You thus want "65-series" tires. Wear problems could have a variety of causes. The problem could be caused by over or under inflation of the tire, mechanical problems or the need for an alignment (caster, camber or toe). Having your tires rotated at regular intervals will help to ensure you receive the maximum mileage from your tires. Most tire manufacturers recommend you have your tires rotated at least every 7,000 mph.